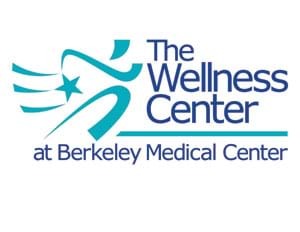 A number of group exercise classes are available to members of The Wellness Center at Berkeley Medical Center. Boost your day with a high-energy workout combining a cardiovascular workout with weight intervals. An aggressive military-style cardio class that combines high-intensity conditioning and power movement for a non-choreographed routine that will leave you feeling like a soldier! The combination of cardio and weights provide the ultimate workout. Improve your cardio health while strengthening core muscle groups. A high intensity cardiovascular workout which includes weights and a focus on the Abs to build lean muscle. A fat burning high impact workout that combines cardio and toning. Cardio kickboxing can burn up to 1000 calories an hour. Various exercises focusing on core and abdominal strength. Wraps and boxing gloves optional. A specialized workout for mature adults that consists of light weight training, range of motion, flexibility and balance. A chair may be used for stability. These classes use a variety of choreographed moves to give your body high results in strength and toning. It’s little impact, but you get big results. These classes conducted on stationary bikes include physical and mental components to stimulate a variety of terrains. Each individual controls his/her intensity by use of the adjustments to the bike. Get ready for a great cardiovascular workout! A fun choreographed step class that will keep you on your toes. High energy fun combination of dance and toning exercises to a variety of music to keep you moving. The last 15 minutes focuses on Abs and lower body. We’ll train, tone, and sculpt your whole body! No coordination or dance required in this athletic-based workout that makes lifting weights fun again. Improve flexibility, strength, and discover how the science of yoga leads to an optimal state of mind, body, and spirit. These stretching and breathing techniques can help relieve stress and relax the body. Monday class—Emphasis on core strengthening, hip opening and low back healing. Thursday class—Emphasis on twisting postures that create alignment in your spine, aid in cleansing your internal body and cultivate calm in your nervous system. A new posture explored monthly in a way to build awareness around your body and lead you to find your expression of yoga. Helps relieve tension and leaves you peacefully energized to move you through your weekend. A mixture of latin dance rhythms. Optimal aerobic benefits are achieved by the interval training method. Dance your way into shape. Ditch the workout and join the party! Water aerobics benefits your body by providing 12 times the resistance of land-based classes, yet only placing 10% of the stress and strain on your body. A cardiovascular workout. This class focuses on flexibility, range of motion, and strength training using pool resistance equipment. An all-around workout for non-weight bearing exercises in the pool. This water class is great for building a strong heart, lung muscles, and increasing flexibility. Barbells, resistance gloves, and noodles are used. Adapted for the water to improve stability, balance. posture, flexibility and core strength. This class incorporates tranquil music with flowing moves and breathing techniques to promote well-being and reduce stress. Make waves with this fun, high energy water workout. The resistance from the water makes this liquid workout feel more intense but with minimum impact on your joints and maximum benefits. Water aerobics incorporating a mixture of latin dance rhythms. We’re taking the zumba experience from land to water.